The award recognises Traveltek's reservation platform, iSell; an integrated travel management system that enables travel agents, tour operators and wholesalers to sell, create and manage their entire travel portfolio from one single, secure, web-based solution. This technology allows travel professionals to search for and book every facet of a customised travel itinerary - from cruises and flights to hotels, transfers and other ancillary products - then sell them as one single package. Traveltek's unrivalled product portfolio also includes consumer facing websites, a CRM and mid-office system; a tour operating platform and an API that connects the industry's largest network of buyers and sellers worldwide. The award marks the end of another remarkable year for Traveltek as it unveiled a restructured and much bolstered sales team, continued its expansion program into new target markets and appointed a new chief operating officer, chief commercial officer and chief technology officer to drive growth in 2019 and beyond. Chief marketing officer, Susie Lawler, and customer services manager, Dianne Clifford, accepted the award on behalf of the Traveltek team. On receiving the accolade, Lawler highlighted what it means to the company. "We're absolutely thrilled to have received this award again. We were lucky enough to pick up Europe's Leading Travel Technology Provider earlier this year and are over the moon to be collecting the Dynamic Packaging Solutions Provider award on the World stage, for the 5th year in a row. "2018 has been a really big year for us, with a lot of change, so it's fantastic to be recognised for the team's continued hard work and commitment. In terms of the focus now, it's about taking the platform to the next level, providing bookers with a more B2C style system, with the same functionality and ease use that was typically reserved for consumers. "We're also in the process of finalising a new product, due to launch in the next couple of months, that will be a real industry first. So, it's a really exciting time for us at the moment; arguably the most monumental in the company's 20-year history." Expedia Group, Rezopia and Goquo were amongst the six contenders to battle for the coveted title. The World Travel Awards were established in 1993 and are recognised globally as the ultimate hallmark of industry excellence. 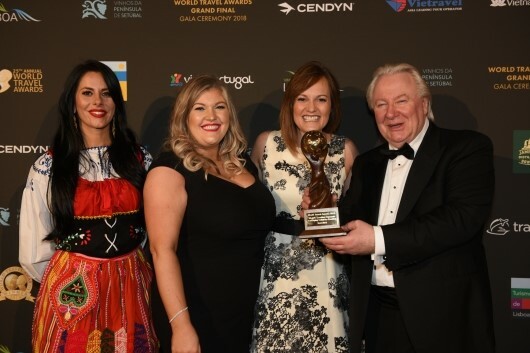 The prestigious Grand Final Gala Ceremony took place at the Ptio da Galé in Lisbon, Portugal and was attended by hundreds of travel, tourism and hospitality professionals from around the globe.